Some incredible folk artists have been emerging from Sweden during the last few years. Idiot Wind is the pseudonym of singer-songwriter Amanda Bergman. 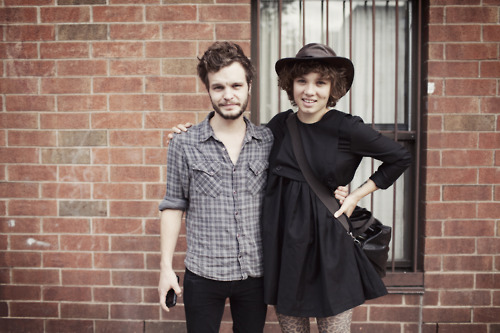 She’s married to Kristian Matsson aka Tallest Man On Earth, and without drawing too many comparisons to their styles; they most definitely share a skill in writing original songs that engage with the listener on an personal level and pack a powerful emotional punch. Yet to release a full length LP, her success rests upon her self titled EP released in 2010. The EP features a beautiful cover of Bob Dylan‘s Mamma You’ve Been On My Mind, which I highly recommend listening to. Before the turn of the New Year, she released two new singles. The use of drums and trumpets in Find The Rhythm in The Noise works wonderfully, and is a change from her usual sound. Lost in The Light is much slower and shows off the perfect marriage of her voice and the piano. Bergman and Matsson often perform together on tour, and recently they covered one of my favourite Damien Jurado songs, Working Titles. Check out the recording of it below. You can buy her new 7″ on her bandcamp page. Hopefully she’ll be touring the UK again soon. This entry was posted in Feature, Listen, Music, New Tracks and tagged bob dylan, damien jurado, idiot wind, new music, tallest man on earth, working titles by Tom. Bookmark the permalink.